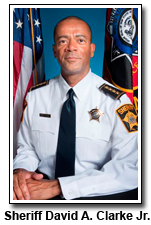 I just saw [Tuesday Nov. 25] on Neil Cavuto's "Your World With Neil Cavuto" show on the Fox News Channel a riveting interview with Milwaukee County Sheriff David Clarke. David Clarke, who happens to be a black man, is one of the first people I have heard who made total sense about the grand jury verdict in Ferguson and the ensuing violence that occurred and was brave enough to say it. I agreed with every single thing this great man said and had to stand up and cheer. God Bless Sheriff David Clarke! See if this great American doesn't make you stand up and cheer. Can you ever imagine cnn or msnbc interviewing this very honest and up front officer?? The truth would interfere with their agenda! I love that rhetoric..."the truth would interfere with their agenda." thanks Brad! David, you are the man!! Thank you for your strength, courage and wisdom! God bless you!! Mr. Clarke, you are the man! Thank you for your courage, strength and wisdom. God bless you!